Touch Of Belle : East End cosmetics Discount code! I love East End cosmetics! they offer branded, discounted perfumes, cosmetics, hair care, skin care, toiletries, beauty products and more. All their products are of really good quality and they are always happy to help if you need any tips or anything! All of their products are really affordable and they often have sales or discounts. 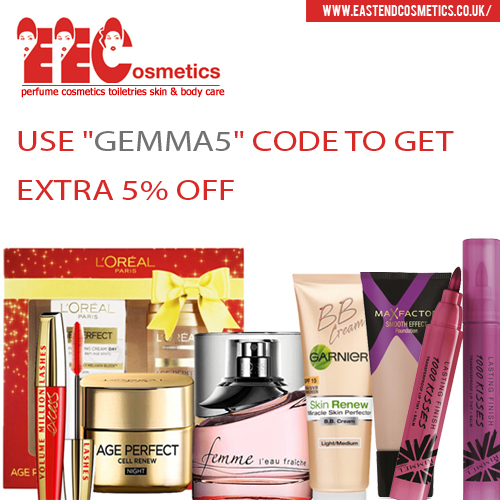 To get a 5% discount off just enter the code "GEMMA5" at the checkout, I would definitely recommend using this code as you can get cheap, good quality products for even less! Thank you for info about East End cosmetics!